Russia’s new history is really about today. It is about everything from denigrating the status of Kyiv to shutting down historical debate. 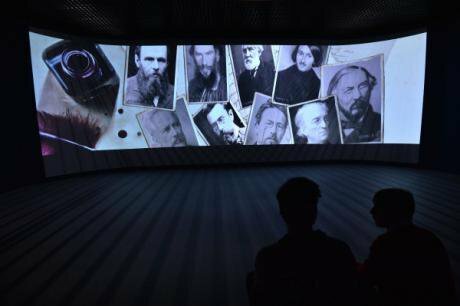 Visitors check out the exhibits at the "Russia - my history" historical park at Moscow's VDNKh. c) Maxim Blinov / RIA Novosti. All rights reserved.Vladimir Putin thinks about history. His reading tastes tend towards histories, and his rhetoric is often rooted in historical parallels, however questionable. He appears increasingly concerned about his own place in it. Apparently, when Putin meets historians these days, he almost invariably asks them what must be an uncomfortable question — what they think future historians will write about him. However, this isn’t just a case of Putin’s personal taste and vanity, but also a sense that the Russian state’s legitimacy rests on its ability to shape the historical narrative. It may not be quite as neat as Orwell’s formulation (“who controls the past controls the future”), but whether appealing to memories of the Great Patriotic War to sugar-coat current hardships, or recreating the political and religious history of Crimea to justify the 2014 annexation, the political dimension of history is rarely far from the minds of Russia’s rulers. Since before his return to the presidency in 2012, Putin has pushed not only the creation, but the standardised imposition of a “new Russian history” curated to maximise political advantage to the regime. This is visible in a wide range of initiatives, from the glitzy "Russia – my history" exhibition at Moscow’s VDNKh exhibition park to the Culture Ministry’s strong support for “patriotic” films and a new raft of approved history textbooks for schools across the country. These initiatives tell us a lot more about today’s Kremlin than the past. When Russia was divided, it was weak; when Russia was weak, it was at risk. In the “Russia – my history” exhibition at Moscow’s VDNKh exhibition park, for example, the Mongol invasion is presented, by the Patriarch, as a civilisational threat to the Russian people brought about by divisiveness – “atomisation” – between the princedoms of the thirteenth century. Apart from the fact that, ironically enough, the conquerors were strikingly uninterested in changing their subjects’ political or social systems, let alone their faiths, this is also used to convey an unsubtle political message. This is that only a single, strong chief executive can make Russian safe and strong. Russians in the past learned this well enough, and the time-honoured (even if historically-challenged) tale of the ancient Slavs calling in a prince from the north-west is back in favour. The Invitation of the Varangians: Rurik and his brothers arrive in Staraya Ladoga by Viktor Vasnetsov. Credit: Public domain / Wikipedia. The Soviets tried to stamp this view out, eager to scotch the notion that Russia needed foreigners to run it. But today’s orthodoxy is more interested in the need for a “power vertical”, the centralisation of decision-making from top to bottom. In Igor Andreev and Igor Danilevskii’s History of Russia, from ancient times to the 16th century (2012), one of a new suite of approved textbooks, the need for a strong leader is framed as a response to anarchy: “Feuds soon began between tribes, military alliances. According to the ancient chronicles, to stop them and to establish order, the national assembly of people of the northern lands decided to invite a prince from ‘across the sea.’” This passage refers to the ninth century; this time, the Russians didn’t have to go so far as Scandinavia, though, just Leningrad/St. Petersburg. Russia has had tough, authoritarian rule, and according to its new history-makers, that’s just great. Ivan the Terrible was a reformer (which admittedly he was in his earlier years, until he succumbed to murderous madness), and so was Peter the Great. The tsars worthy of mention all did their bit, and so did the Soviets (in terms of what they did for Russia, not Marxism-Leninism), until Gorbachev and Yeltsin let things fall apart. One can only wonder why Russia is not in a rather better position today, given centuries of enlightened modernisers. In many ways, omissions say more than endorsements. That the horrors of Stalinism and the shabby details of the 1939 Nazi-Soviet Pact are played down, that the suppression of the 1956 Hungarian Uprising and 1968 Prague Spring are glided over is hardly surprising. Given that Russia is still coming to terms with its Soviet past, in some ways this is natural. If nothing else, Russia’s citizens are yet to find the balance between being the victims and perpetrators of atrocities. In this respect, Russia has it uniquely difficult compared with the other Soviet successor states, who have Moscow to blame. But deeper history is also being edited for immediate political importance. Remember when the pre-Mongol realm was known as Kievan Rus’? After all, Kyiv was the pre-eminent city in the region during the 11th century, a glittering metropolis compared with the trading superpower of Novgorod and the then-all-but-unknown village of Moscow. Moscow can thus avoid recognising the former primacy of Ukraine’s capital (which it now excoriates with regular vitriol), but also bring the cultural uniqueness and historical legitimacy of Ukraine into question in a way that favours Russia. If history somehow grants a country special geopolitical rights — as the Kremlin often seems to think — then, if anything, Kyiv has a claim to Moscow’s fealty. Ironically enough, Dmitri Livanov, the education minister under whom these texts were introduced, has just been appointed presidential envoy for trade and economic ties with Ukraine. That will make for some nice chats. Perhaps most important is the omission of uncertainty and debate. When Sergei Mironenko, director of the Russian State Archive, released documents in July 2015 that raised questions about the historical truth of the heroic myth of a group of Soviet soldiers celebrated in the Great Patriotic War film Panfilov’s 28, for example, he was slapped down by culture minister Vladimir Medinsky, who said that an archivist “is not a writer, a journalist, or a fighter against the fabrication of history.” Mironenko stepped down. 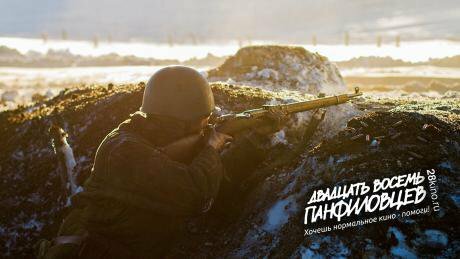 The new film Panfilov's 28 tells the story of a group of soldiers who sacrificed themselves in the defence of Moscow in November 1941. CC-SA 3.0 28kino.ru. Some rights reserved.The moral of this story was simple: the archives are not home to discussion and interpretation, but armouries from which the culture warriors can pick and choose their favoured weapons. Indeed, Putin himself signalled as much back in 2013, when he warned that the new history had no room for “different interpretations”. The “Russia - my history” exhibition at VDNKh exemplifies this. From personal experience, it is attractive and exciting, but also carefully framed to present a single, politically-convenient narrative. It is theme park history, a roller-coaster ride with soaring ascents and terrifying descents, but the guests are there to be carried in a single direction, not choose their own route. It is hard to think of something more corrosive to the genuine study of history than the wilful exclusion of pluralism. History is about the stories we create from the usually-limited and ambiguous data at our disposal. There are facts that are proven pretty much beyond any question, but the interpretation of those facts is always a matter of judgement and perspective. History does not just permit different interpretations, it bluntly demands and joyfully generates them. History is many things, but never static. Putin is creating not history but scripture. What’s the Kremlin’s definition of a big-ticket initiative that doesn’t end up profiting its friends? A terrible waste. Back in the 1990s, the provision of school textbooks was a lucrative source of corruption. After the state gave up its monopoly in 1994, the business came to witness an intensity of competition usually associated with Russia’s metals business. With Russian publishers facing the same kinds of pressures as everyone else, a guaranteed market to schools and universities is a prize indeed. 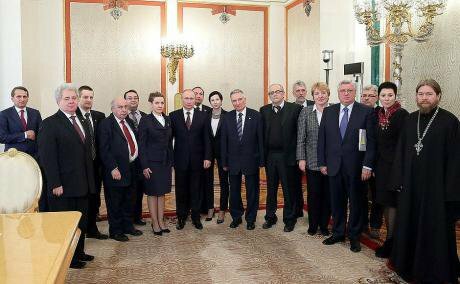 January 2014: Vladimir Putin meets with designers of a new concept for teaching Russian history at the Kremlin. Source: Kremlin.ru.No surprise, then, that the three publishers behind Russia’s new history textbooks — Prosveshchenie, Russkoye slovo and Drofa — are all in safe pairs of hands. The Rotenberg brothers, Putin’s closest money-men confidantes, have a stake in Prosveshchenie. Russkoye slovo is 90% owned by Vladimir Vakhrameev, a member of the Orthodox Entrepreneurs’ Club, an organisation closely connected with “patriotic-nationalist” circles. Drofa is a subsidiary of Eksmo-AST, criticised in the past for publishing favourable perspectives on Stalin, and likewise considered a “responsible” publisher. These are publishers clearly trusted to handle the job professionally and effectively -- and not to rock the boat. New education minister Olga Vasilyeva is a professional historian, but one whose career clearly suits her for the new history. Her intertwined areas of specialism (Stalinism and the Russian Orthodox Church) certainly prepare her for an era in which scholarship is more about orthodoxy than anything else. Vasilyeva’s role in the parliamentary committees generating the new line on history help explain the positive gloss applied to all kinds of monstrosities “for the good of the state”. After all, in her view, Stalin “for all [his] shortcomings,” was a good thing because he “fostered the unity of the nation” and brought the Soviet Union victory in the Second World War. A huge body of scholarship, much of which carefully demonstrates how Stalin actually hindered the Soviet war effort on balance, is dispensed with at a sound bite. So this, then, is how the new history is a metaphor for late Putinism. History as a vehicle to reward cronies and assert the desperate need for the power vertical. History carefully purged of awkward facts and difficult questions. History converted from debate to catechism. History portraying Russia as at once hero and victim, the country’s past simply a painful prelude to Putin’s rule. Want to know more about Russia's higher education system? Read Tatyana Dvornikova on how the Kremlin's "optimisation" agenda is impacting on students, staff and institutions.